A wonderful book came in the mail today. Handmade Rugs by Ella Shannon Bowles was written way back in 1937. 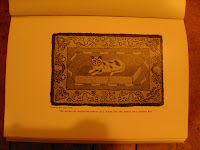 The author learned about rug hooking from her grandmother, who was probably making rugs in the last part of the nineteenth century. Mrs. Bowles researched rug hooking, mostly in New Hampshire, and shares what she learned about the old rugs and the old methods. Reading her research puts the reader right in contact with rug hookers and collectors who knew the rug makers who hooked before burlap came to America. A couple years ago - using my first copy of this wonderful book - I used the pattern Mrs. Bowles uses to explain how to hook, to create a challenge. 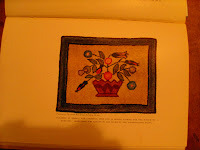 Each person who accepted the challenge received a sheet of paper that had templates printed on it for the flower and leaf shapes and the basket found in the color photo above. They didn't get to see the photo so they wouldn't be influenced by it. They had to create their own flower arrangement and color plan with only those motifs and the rug size as their instructions. 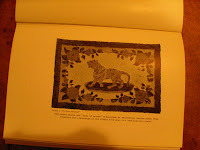 The rugs they created were really wonderful, each one similar but none the same. A Happy 2008 to Everyone!